I have not flown to or from Gatwick ever with Ryanair, so it should not show me flights from Gatwick. The vast majority of my Ryanair flights are return flights from Dublin, so it should not suggest that I visit Dublin. All my profile details indicate that I live in Ireland, so it is highly unlikely that I will ever fly to Belfast, Shannon, or Cork. I am not sure why Alicante is there! 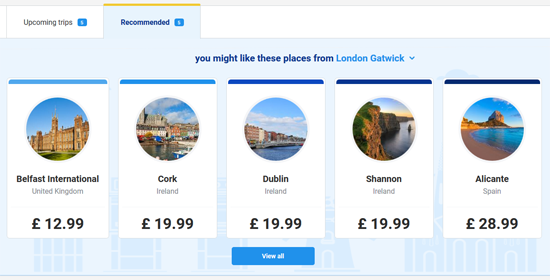 It really seems that Ryanair’s recommendation system is worse than a random suggestion engine! 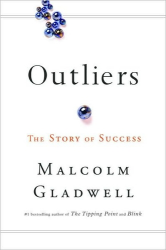 I finished reading Outliers by Malcolm Gladwell this weekend. For more information about it see Outliers or Outliers (book), and you can buy it at Outliers: The Story of Success. I enjoyed reading it. It was fairly easy going, and it was always interesting. There are plenty of reviews online already, so I am not going to add another. However, there was one very interesting piece of information that surprised me, so I will describe it here. Chapter seven discusses plane crashes, and it describes a concept called the Power Distance Index (PDI). I will summarise this index by stating that a high DPI basically means that a subordinate is unlikely to be confident enough to contradict a superior, whereas a low DPI means that a subordinate sees himself/herself as an equal to his/her superior. In the context of flying a plane, it is more desirable to have a pilot and co-pilot who come from a low DPI culture so that they can work well as a team of equals. In other words, if the pilot is doing something incorrect, then you want to co-pilot to be comfortable enough to clearly point-out the problem. It is an interesting mix covering south and central America, Africa, and Asia. I am not able to see any pattern there. I do not find this in any way surprising, because in a general sense these are all countries that share a language (English) that does not support formalities, and they provide relaxed workplace environments where subordinates and superiors are all friends! It is fascinating to see how US Airways is embracing Twitter, as described in US Airways Just Tweeted Out One Of The Most Graphic Things You’ve Ever Seen A Brand Tweet. What are even funnier are some of the tweets in 38 Priceless Twitter Reactions to That NSFW US Airways Tweet. Luca Iaconi-Stewart is building a paper plane – but not any paper plane! He is building a pretty excellent model of a Boeing 777! Read about it in Coolest paper airplane ever and the plane nut who built it (Q&A), and look at the photos in his photo sets! The A350 had its first test flight today – see Airbus A350 successfully completes maiden test flight. The video in Airbus A350 Rolls Royce XWB engine: Close up look is also worth watching. I am amusing myself for the last few minutes of the day looking at Plane Finder! It is very impressive, although I do not know how accurate it is. Remember Air France Flight 447? Somebody sent me this fascinating article about it today – What Really Happened Aboard Air France 447. It is so tragic that the accident could have been prevented at multiple occasions, and that ultimately that the accident was due to unforced human error. I definitely blame the airline and the pilots. Another news story that caught my attention during the week was the first commercial flight of the Boeing 787 (otherwise known as the Dreamliner), as reported in Boeing’s Dreamliner completes first commercial flight. There are some good videos in the article, and as a passenger I am impressed with the extra overhead baggage room. For more information about the aircraft see Boeing 787 Dreamliner, and for the best photos see Airliners.net. Wow – I recently read that Ryanair uses HTTP Cookies to remember when a user returns to book flights for which he/she previously checked the availability. Fair enough, but apparently Ryanair charges a higher fare in this case! I do not know if this is true, but I think it would be unfair and deceptive. This sort of practice certainly strengthens the arguments for the current EU proposals regarding HTTP Cookies!